People usually think that making cakes is a long and cumbersome process, and that eggless cakes don't turn out as well as the normal egg ones. 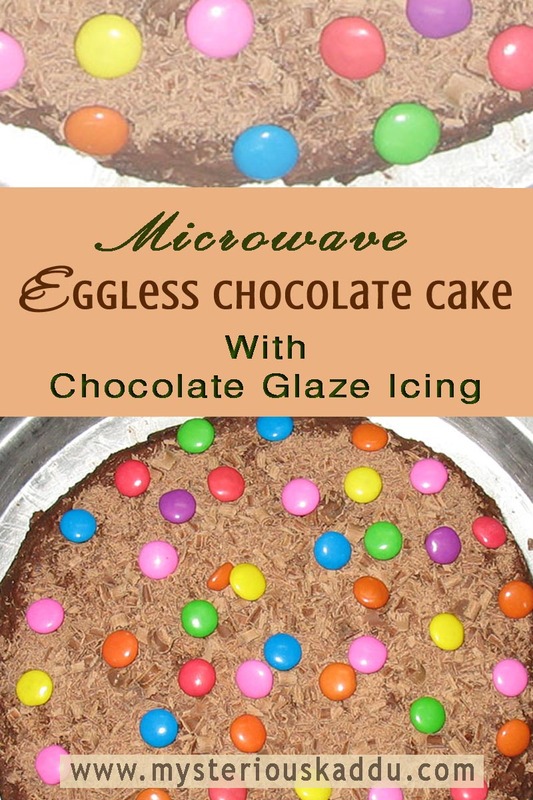 But this Microwave Eggless Chocolate Cake Recipe, With Chocolate Glaze Icing, proves them wrong on both counts. I made this Eggless Chocolate Cake for my birthday in 2011. Before this, the last cake I had baked was in the year 2000, when I was still working with one of those old round aluminum ovens. So this was the very first microwave cake recipe that I had tried. It was also the very first eggless cake recipe that I had tried. 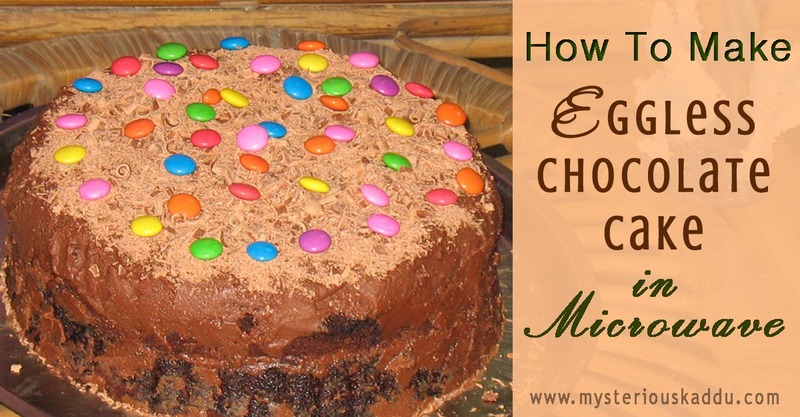 And seriously, this HAS to be the EASIEST and QUICKEST recipe for making a perfectly spongy eggless chocolate cake! Aside from the cooling time, the entire baking, icing and garnishing took hardly 20-25 minutes, and that was when I was doing it for the first time. Besides, the Chocolate Glaze Icing and garnishing are totally optional. I did all that because it was a birthday cake. But you can make the sponge cake on its own too, like a tea-time cake, you know. It will take hardly ten minutes to make, and it tastes absolutely delicious. 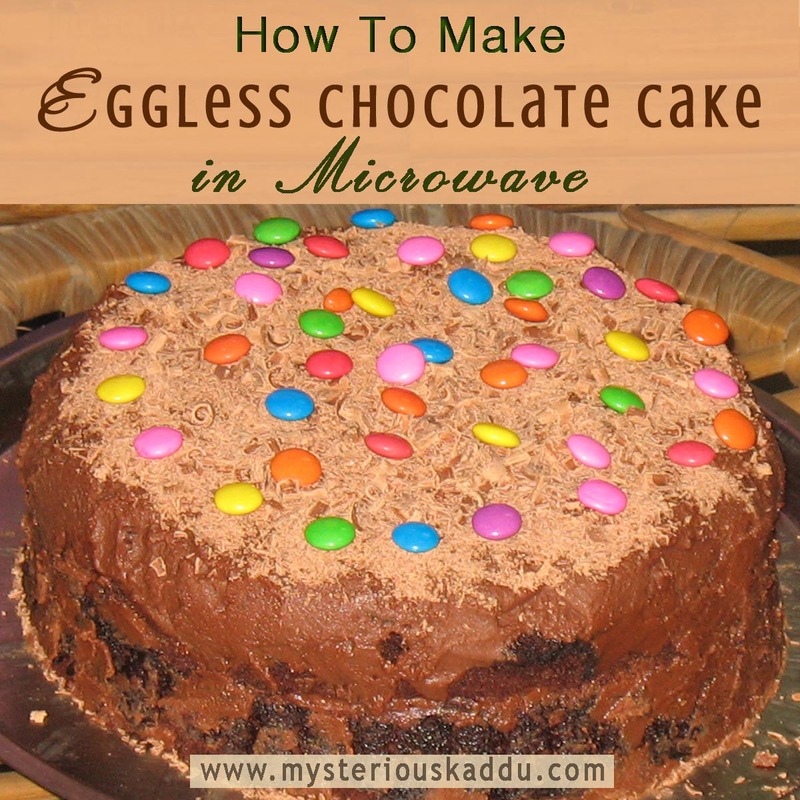 So here's the recipe for making eggless chocolate cake in microwave, with chocolate glaze icing. Sieve the first five ingredients together (all the dry ingredients... four if drinking chocolate is not used) and keep aside. Run the curd through a blender or sieve it so that it flows smoothly without lumps. Add the milk to the curd. Heat the butter in microwave for 30 seconds on P100. It should start bubbling on the top. If it doesn't, then micro again for another 10 seconds. Add this to the curd-milk mixture. Add the sieved dry ingredients to this curd mixture. Leave in oven for like 5 minutes, then take it out and let it cool before removing the cake from the dish. Note: Simply greasing the dish doesn't really work too well. The cake left the sides on its own after a few minutes, but the bottom didn't come out too clean. I remember when my mom used to make cakes in that old round aluminum oven, she used to make me cut and grease brown paper to line the dish. 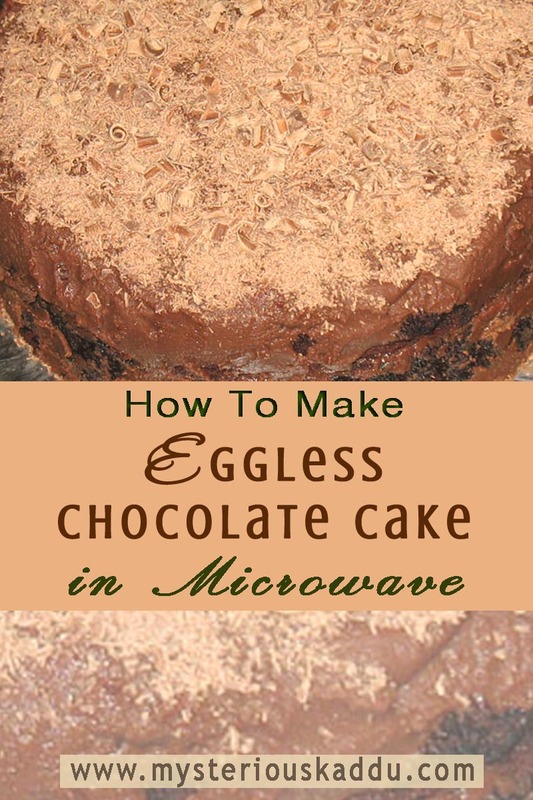 I'm not sure right now if brown paper can be used in the micro for that long, but if it can, I'll definitely use it for lining, when I make this Microwave Eggless Chocolate Cake again. Micro on P100 for 30 seconds. This Chocolate Glaze is generally used on doughnuts, cookies, cupcakes etc. But I find the regular cake icing too sweet (as in "sickeningly sweet"! ), so I tried this on the cake. Everybody loved it! Just run a vegetable peeler knife along the edge of the chocolate bar. Cold bar gave grated chocolate, and slightly warmer bar gave proper curls. Decorate the cake with it. I made this Microwave Eggless Chocolate Cake in such huge quantity, because well... we all usually love chocolate cake, don't we! Not my nephew Yuvraj though! He loves chocolate alright, but he hated cake in those days! Just a month before my birthday, he celebrated his. And he didn't take a single bite out of his own birthday cake! So I wasn't really expecting him to take a fancy to my cake either. But I was so wrong! This is my fifth post for A to Z 2019. Thank you for sharing this recipe. My Dad is allergic to eggs and we struggle to get Eggless cakes. I'm going to try this at home and let you know how it turns out. This seems like an interesting recipe though I never make cakes in a microwave. If a kid loves a cake and polishes it off, it is proof that it is awesome! I love the fact that you've added curd to it. Very nice! I have only tried the 3 min mug cake in microwave. But this looks so awesome that I might give it a try. And it only takes 7 minutes. Even better! How's the texture? Is it Spongy? This sounds good. Will pukka try it. Ah, thank you for this, Chikki. I tried one eggless cake recipe for microwave last month. But the whole thing turned out to be really really bad. I will try this one for sure. I am on a weight loss mode and here I read this delicious recipe! Sigh! But I will give it a go sometime and let you know how it turned out to be. In baking, the most tiresome thing I find is to mix all the ingredients, as in, beating them with hand, and I don't have that mixer. Looks so yummy! I haven't baked a cake at all. Maybe this is a good recipe to start with. I liked the addition of drinking chocolate, have never used that in a chocolate cake. Will try your recipe next time. My mouth was watering, as I read your recipe! You must have felt truly accomplished once your nephew Yuvraj appreciated your cake by not only indulging in it but also by giving you gems to decorate it! Question - can we replace Maida with whole wheat flour? Will it give the same result and taste?